04-Apr-2010 -- This was an unsuccessful attempt at visiting N0 E101. We arrived at around 2 am in Lipatkain a small town along the road to Talukkunatan after a terrible 11 hour bus ride from Rantau Prapat. The hotel was closed and the restaurant we took shelter from the rain was also about to close. But the typical Indonesian hospitality saved us once again. One of the blokes we chatted and joked with at the restaurant invited us to his home. He brought us to his aunt’s house who had already prepared some mattresses and blankets for us. Before he dropped us of he gave us even a small tour of Lipatkain, which consists mainly of some unremarkable buildings along the main drag and an Equator Monument, reminding the awed visitor that the equator line cuts right through the town. Thomas and his brother came the next day and brought breakfast. We asked for buses to Sungaisarik a small village which is just a few kilometers from the confluence and at first could not believe when we were told there were none. Although they had a busy schedule because one of their sons competed in a Motorcycle race that day, our hosts helped us to find a guy who would bring us to Sungaisarik for a few Rupies. After explaining our goal and pondering over the map for a bit we started at a small crossroad at the southern end of Lipatkain. The tarmac gave soon way to gravel and the gravel track deteriorated to yellow mud. It had rained the last few days which brought the road quality down a few notches: from terrible to nightmarish. Soon we were caked in bright yellow mud and pushing and dragging the motorcycles through the knee deep muck, instead of driving them. Some 4wd vehicles following us were forced to turn around. 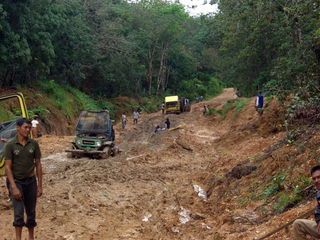 Around 14 kilometers from the confluence we encountered two trucks and a jeep that had died in the mud. Lumberjacks were gathered around the vehicles and tried without enthusiasm to dig them out. We calculated that we would not reach the confluence before nightfall at this pace and had no hope of improved conditions down the road. So we decided to turn back. Since we started soon after dawn, it was before noon when we arrived back at Lipatkain. After cleaning ourselves as best we could in the river near the crossroad we left Lipatkain for Pekanbaru where we started a second attempt. This time we tried to reach Sungaisarik via Kotapadang from. We left the bus to Bukkitinggi short after Bangkiang, bought something to drink and started to follow a promising tarmac road going south. As always we attracted attention. Soon we were surrounded by people eager to help inquiring where we were going. A teacher from Pekanbaru gave us a ride. But after a long Odyssey over small streets we arrived at Kebondurian. A group of motorcycle drivers we asked pointed us again to Lipatkain and gave us a comprehensive description, adding that it would be the only way reaching the confluence. I refuse to believe that the shabby dirt track through the jungle is the only way to reach Sungaisarik or Kotapadang. Our Sumatra map showed several roads leading to the confluence, but it proved to be somewhat inaccurate on other occasions as well. Satellite images of the confluence show quite benevolent territory. There has to be a decent road, we just missed it. In any case it would probably best advisable to attempt this confluence not during the raining season.